Friday is here again Asymptote readers, creeping upon us like Saturday will tomorrow. Will there ever be time enough to read and keep abreast of all the literary news? 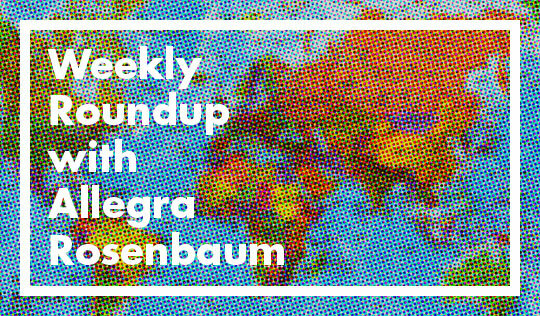 Well, with another Friday comes another Weekly News Round Up to help you do just that. The National Translation Awards announced its longlist this week, twelve of which are Asymptote contributors! We are proud to call these writers a part of our family of contributors. Good luck to them as the judging continues! What a dream come true for those writers, and speaking of dreams, the Awl published a piece on the history of interpreting dreams. If you think it began with Freud, you are dead wrong, or you might just be dreaming! One of my dreams is to be a roving expatriate writer in Europe, Midnight in Paris style. While this may remain a to-be-determined future for me, it’s a reality for writer Anne Korkeakivi. It also may not be as glamourous as I make it out to be. Here’s Korkeakivi’s take on the expatriate literary community. If you’re hungry for more expatriate writing, read Polish writer Marta Dziurosz’s interview on Brexit featured in the Quietus this week. And if you’re hungry for more Brexit writing, read Megan Bradshaw’s essay or Ewa Stańczyk’s essay both featured in the Asymptote blog. In mainstream translation news, the Wall Street Journal published an interview with the director of the animated movie The Little Prince. It’s challenging to translate a work that is so well renowned and then to have to adapt it for the screen! That’s not something I dream of! The 2016 Olympics are happening as I write this, a dream for many (not me, but many!). What a time for global camaraderie. Literary Hub hopped on this sporty bandwagon by publishing an amalgamated piece from 20 writers around the world on the Olympics. Thanks for joining us, dreaming Asymptote readers. And don’t be afraid to realize your dreams, like Vladimir Nabokov’s ‘great gay comic novel’ or the Times Literary Supplement contributor Edmund White’s tentative dream to meet Nabokov in person. We hope you’ll make our dreams a reality by joining us again next week!